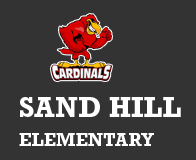 The mission of Sand Hill Elementary School is to provide a positive environment that fosters academic achievement, high self-esteem, and good citizenship among the students. School personnel will act as role models promoting learning as an enjoyable, useful, continuous experience. Utilizing the cooperative efforts of parents, community, students, and staff we will expand knowledge through academic and life experiences to help each child realize his/her potential. All students will receive equal and quality educational opportunities to succeed in an integrated environment that meets the student’s needs.